The Antique Wireless Association (AWA) is one of the largest international non-profit historical societies devoted to the study and preservation of the History of Electronics. Located in Rochester, in the USA, now incorporated in the state of New York, it was founded in 1952, by the American radio amateur and historian Mr. Bruce Kelly Nowadays the Association membership peaks at over 5000 either in the USA as well all over the world. Further to its extensive calendar of activities such as: antique radio exhibitions, publication of journal and reviews, preservation and archiving studies, organization of one of the largest radio museum, the Association board of directors have included also in the same several recognition awards to someone who has done outstanding and significant work of long duration related to the preservation and documentation on the History of radio and related matters. Bruce Kelly - OTB Award: in memory of Mr. Bruce Kelly, AWA founder is given to the member who publishes in the AWA Journal an article judged to be the most outstanding, original, historical presentation of the award year. Taylor Award: in memory of John Taylor, RCA TV developer is for preserving television history. Tyne Award: is presented, in remembrance of Gerald F. J. Tyne, (author of the book: "Saga of Vacuum Tube"), for contributions to preserving or documenting the history of valve technology. 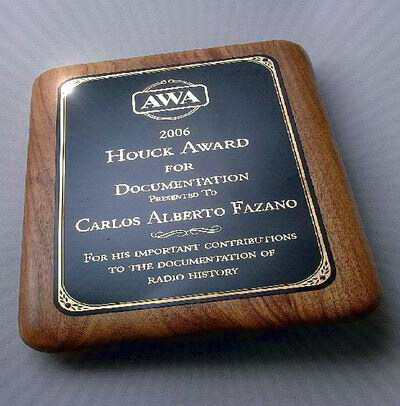 Houck Award: for documentation goes to an AWA member who has written several original articles on radio development or history in the AWA Journal, AWA Review, or other publication, including a book.